Located in Bury, Greater Manchester, at the largest Fire-Fighter training facility in the UK, is a purpose built Greater Manchester Fire and Rescue Service Training and Safety Centre. Designed to inform visitors of all ages about how to protect themselves against fire and other dangers. 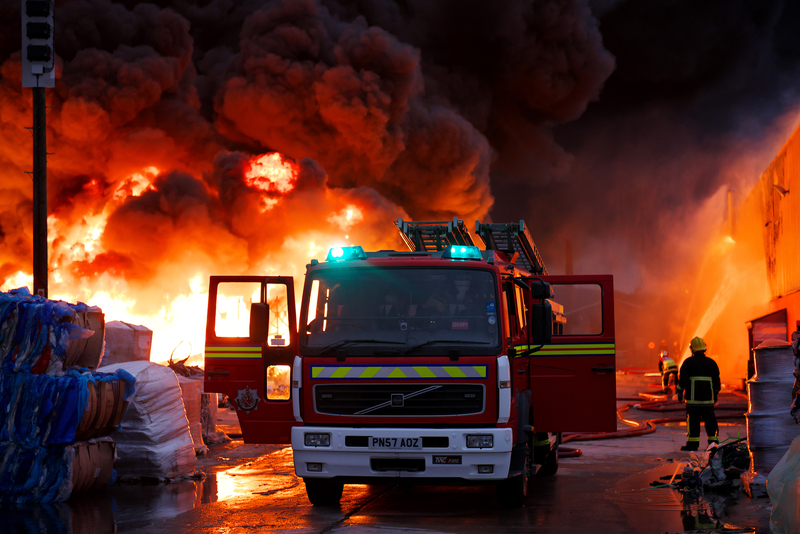 'The visit that could save your life' will introduce you to the work of Greater Manchester Fire and Rescue Service and allow you to experience our impressive immersive theatre, which will provoke your senses with the smell of smoke, the heat of fire and the sound of sirens to put you at the heart of the action. The new Greater Manchester Fire and Rescue Service Training and Safety Centre, located in Bury, not only serves to deliver realistic training to our firefighters, it offers a FREE interactive learning opportunity to all schools and communities. It will provide a curriculum enhancing, immersive and interactive learning environment that supports the work of schools and emergency services, and shows visitors how to protect themselves against fire, dangers and what to do in an emergency. 'The visit that could save your life' will introduce you to the work of Greater Manchester Fire and Rescue Service and allow you to experience our impressive immersive theatre, which will provoke your senses with the smell of smoke, the heat of a fire and the sound of the sirens to put you at the heart of the action. In our Emergency Control Room you can listen to 999 calls. Our Survival Academy enables everyone to learn how to respond to an unresponsive, breathing casualty and put them in the recovery position before dialling 999. In the street, you will help to investigate a simulated road traffic collision scene, before going in to the full size firehouse to spot potential risks and learn how to escape the fire. When training is taking place, visitors will also be able to gain an insight in to the work GMFRS do at incidents, as they watch live operational training from the viewing gallery and during guided tours of the site. See Group Bookings tab for session times and further information. Not a KS1 or KS2 School Group? Don't miss out, email us to tell us about your group and to be kept informed as our educational and events programme develops. The Safety Centre is available for FREE visits from anyone in the Greater Manchester community. We also meeting rooms available for hire. To book a KS1 visit (6 - 8 year olds) please contact the centre for more information. We recommend a morning visit for these ages. The Training and Safety Centre was built to teach everyone in the community how to stay safe and well using an interactive and immersive learning experience. Our learning journey is designed to be accessible to all members of the community. Most of our activities can be adapted to meet any educational or access needs a group may have. Get it touch to find out more, or to book a visit! Facilitated Key Stage 2 (ages 8 – 11) school bookings are being taken for groups of up to 60 learners. Get your pupils learning outside the classroom, working together, investigating and exploring, in GMFRS’ Training and Safety Centre. The visitor journey will take your learners through the eyes of a firefighter, taking on the role of GMFRS recruits, the participants will experience a 999 control centre, respond to a road traffic collision, carry out a safe and well check, learn about the recovery position for an unresponsive casualty, investigate fires and many more exciting activities! Our teacher and learner resources are designed to reinforce key safety messages whilst working towards National Curriculum outcomes. The visit and resources are designed to encourage learner’s current and future moral, cultural, mental and physical development. At GMFRS we aim to prepare all learners for the opportunities, responsibilities and experiences of later life, promoting the development of knowledge, understanding and skills they need to be educated citizens. We're working on education resources to enhance school group visits and support class room activities. This includes prelearning to be done before a visit and post learning to be done after the visit. Group size of 10 – 60 learners. The maximum group size we can take is 60 young people. Our adult to child ratio for visits are 1:10, groups are asked to make sure that there are enough accompanying adults on the day, you can bring more adults to meet your own school's requirements. All group visits must be booked a minimum of two weeks in advance. Cancellations must be made a minimum of one week in advance. Learn how to put an unresponsive, breathing casualty into the recovery position. *We will try our best to be flexible with session times, so please enquire for availability for earlier or later start times. Email: safetycentre@manchesterfire.gov.uk for further information. There is seating inside and outside at the Safety Centre, so visitors can bring a packed lunch. We are also working on being able to offer food and beverages in the future from our café. In the mean time we have some vending machines. If you are part of a large group, let us know so we can reserve some seats for you. Whether it is pocket money for fire helmets and safety stickers, or super scale fire engines, our shop has something for everyone to take away as a memento of their visit. For Key Stage 2 visits Book Now! Contact us to discuss using the site for other groups. Some of the activities may involve some physical activities, so please wear appropriate clothing and foot wear. Trousers and flat shoes recommended. There may also be the opportunity to go outside and watch some of our operational training so visitors are asked to make sure that everyone brings suitable footwear and a coat in case of bad weather. To enhance the visitor experience, the GMFRS Training and Safety Centre uses flashing lights along with heat and scent cannons which may affect some people. Please be aware that the simulated fire scenes and 999 calls are based on real events and may be upsetting for some visitors. Due to the purpose of the site, there may be props in public areas, please take care where you walk. The centre not only offers a curriculum enhancing, immersive and interactive learning environment that supports the work of schools and emergency services, but also shows visitors how to protect themselves against fire and other dangers and what to do in an emergency. JOIN OUR CREW, VOLUNTEER NOW! Volunteers will be essential in the smooth running of the Safety Centre, interacting with members of the public to share safety messages to help make Greater Manchester a safer place to live, work and visit. As a dedicated member of a team of Volunteers, you will be specially trained to assist at the Training and Safety Centre. From greeting visitors, supporting scenarios, assisting with guided tours, providing information to the public for the operation of immersive technology, including smoke and heat cannons and interactive tablets, there is a role for everyone. Volunteer Now! Learn new skills, meet new people, keep active and help support your community. 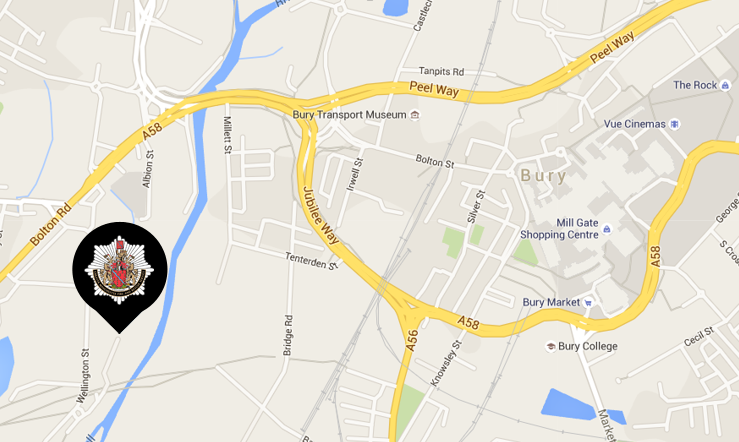 The GMFRS Training and Safety Centre is approximately a 15 minute walk from the Bury Interchange. The most direct route is via a footpath from Bridge Road; once you pass the High School buildings on your left, take the left fork of the path down the hill to access the pedestrian bridge to the Centre (not the right fork up onto the viaduct). Alternatively, you can stay walking on the main road – Jubilee Way/ Bolton Road, away from The Rock in Bury. When you walk past the Domino’s take the next left down Arthur Street and follow the road all the way down. You will pass the security lodge, carry walking down and take the next left to our main entrance. You can press the button to reception and someone will open the gate. There is plenty of cycle parking outside the main entrance. NCN6 passes over the viaduct outside the Centre; to access the Centre, take the fork of the path from the viaduct on the east side of the Irwell to access the pedestrian bridge over the river to the Centre. Bury Interchange is accessible by Metrolink and bus. Buses from Bury Interchange: The numbers 91, 98 and 471 from Bury Interchange will take you to Bolton Road. Get off outside Millercare, walk a few paces up to Arthur Street which leads to Wellington Street, turn right on Wellington Street and keep walking until you go under the old railway bridge and double back under the next arch to gain access to the site. There is a car park and space for three coaches. By road from the M66: Leave the M66 at Junction 2, follow the signs to the centre of Bury, then A58, Bolton Rd, towards Bolton, turn left in to Arthur Street at the lights, continue to Wellington Street, turn right and continue under the Railway Bridge, double back under the next arch to access the car park. Postcode BL8 2GN (Sat Nav use BL8 2AL), but continue to the end of the road underneath the railway arches. Ask us a question, provide feedback or register to be kept informed. Our safety learning programme will be most suitable for Key Stage 1 and 2 school groups, (ages 5 – 8 years and 8 – 11 years), but it will be quickly developed to offer something for people of all ages. Not a Key Stage 1 or 2 Group? Click 'Register to be kept informed' below for information about new educational visit programmes for other age groups and special events and activities. Visit our dedicated social media to check our progress over different platforms.